Twenty-one years ago today was the day my first chick hatched. Wow. That was "Pheasant." I had intended to do a lot of horsey stuff today but it was horribly windy and annoying, so I didn't get done as much as I had planned. 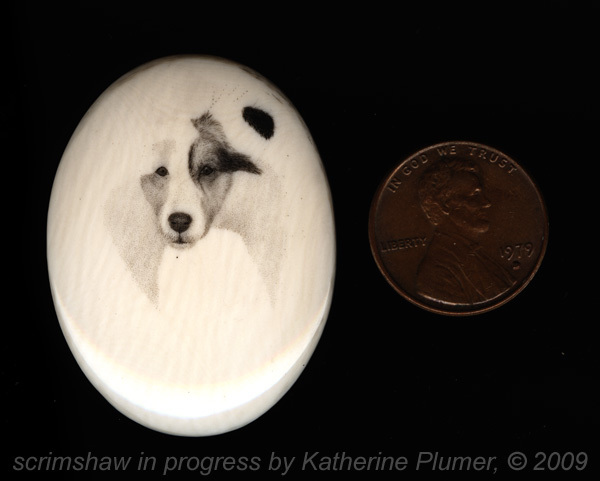 But I did do more scrimshaw! It's on odd place to stop for the day with one ear floating in space, but hey, it'll get there. Since this piece is going to be done with a LOT of lines, I decided to try out a different tool for that, since making lines with the etching needle always makes me grumble and the lines never seemed to hold ink all that well. I'm using an X-acto knife for the lines now and very happy with it. The dots are still done with an etching needle. I ink it with etching ink as I go. There isn't a right or wrong way to use lines or dots, in my opinion. Some people seem to think that one or the other is better, but really I think it just comes down to what the image is. You can make any image entirely out of lines (but it's hard, I'm not really into that). You can make any image entirely out of dots (can also be hard). Some need one or the other. This one uses both! I will post closeups when I'm done. And I forgot to scan it with the penny yesterday! D'oh! Oh my word, I didn't realise how tiny it is, how do you manage to get so much detail in such a tiny space!?! I work at a microscope. Scrims are meant to be seen with a "naked eye." The image should be of reasonable size and detail that if you hold the piece in your hand you know what it is (I've seen an engraving soooo small I had no idea what it was until I looked at it under the scope). However, in order to be able to create the detail in an image that size, the human eye needs some help! So that's why people use microscopes or other types of magnification. Much healthier than eye strain from trying to work without magnification!